This article is about Bayonetta's appearance in Super Smash Bros. Ultimate. For the character in other contexts, see Bayonetta. Bayonetta (ベヨネッタ, Bayonetta) is a playable character in Super Smash Bros. Ultimate. She was confirmed as a playable character on June 12th, 2018. Bayonetta is classified as fighter #63. 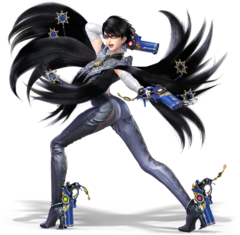 Bayonetta is once again voiced by Hellena Taylor in English and Atsuko Tanaka in Japanese, using recycled voice clips from Super Smash Bros. 4. Play VS. matches, with Bayonetta being the 43rd character to be unlocked. Clear Classic Mode with Mario or anyone in his unlock tree, being the second character unlocked after Sonic. Have Bayonetta join the player's party in World of Light. With the exception of the third method, Bayonetta must then be defeated on the Umbra Clock Tower. Bayonetta in Smash 4 was considered by many players as the best character in the game, even after having received nerfs in updates, due to many of her extreme advantages remaining intact, including most infamously her ability to KO opponents at virtually any percentage with successful ladder combos. These traits often caused players to label her as "broken", and many matches involving her became controversial. This includes the Smash Ultimate tournament Super Smash Bros. Invitational 2018, where the top professional Bayonetta player MkLeo pulled off a ladder KO in front of Masahiro Sakurai. Possibly as a result of these events, Bayonetta has been significantly nerfed in the transition to Ultimate, and is by far the most nerfed character in the game, in a similar vein to Meta Knight in Smash 4. A noticeable nerf is to Bayonetta's overall frame data, which appears to be even worse (not good, considering it was already her main weakness in Smash 4). Bayonetta's most reliable combo starters have been weakened, with her up tilt, down tilt and forward aerial all having more ending lag; the latter in particular has been affected the most significantly, no longer allowing for any followups other than the next hits of the move. Witch Twist also has more startup and grants less distance, reducing its effectiveness as a combo starter, out of shield option and followup from other moves. Adding to this, all of Bayonetta's special moves have received nerfs that make them more punishable: Bullet Climax's charge takes longer to cancel, Heel Slide and After Burner Kick's followup hits can no longer be used if they hit a shield, Witch Twist takes much longer to grab ledges, and Witch Time slows down opponents for much shorter except at very high percentages, alongside having noticeably more startup and ending lag. Bayonetta's KO ability has been toned down as well. Her neutral, up and down aerials deal lower knockback (most significantly the former two), her back aerial has shorter range making it harder to sweetspot, and her smash attacks only get half as much of an increase in power when charged. This is exacerbated by Witch Time's decreased slowdown duration, hindering its ability to lead into safe KOs, and due to the severe nerfs to her up aerial, she can no longer KO with ladder combos unless they are initiated very close to the top blast line. As a result, Bayonetta now has a significantly more defined main weakness, which is her lack of KO ability at higher percentages. Conversely, her own endurance has been worsened, as her already low weight has been decreased further, and her recovery is less effective due to Witch Twist's shorter distance and slower ledge grab. On the other hand, Bayonetta has received a few noteworthy buffs. Her dodges have been sped up relative to the rest of the cast, no longer being among the slowest in the game, while still having the ability to trigger Bat Within during their startup. Heel Slide and downwards After Burner Kick are more reliable combo starters, the former due to its lower ending lag on the second hit, and the latter due to launching grounded opponents at a higher angle. Lastly, her forward throw is somewhat more effective for KOing at high percentages, and Witch Time can slow down opponents from much farther distances upon a successful counterattack. However, these buffs fail to compensate for the comparatively much larger impact her abundance of nerfs has brought up. Overall, Bayonetta performs significantly worse than her Smash 4 iteration and has a considerably higher learning curve than in Smash 4 due to the significant loss of her vertical ladder combos. As such, Bayonetta is widely viewed as a high-effort, low-reward character. Though she had a moderate amount of success during the beginning of Ultimate's metagame, her current representation has quickly dwindled as many Smash 4 Bayonetta players, including Captain Zack, tamim, and Lima, have either dropped her, use her as a secondary, or have quit competitive play altogether. As with all veterans returning from SSB4, Bayonetta's model features a more subdued color scheme. Love is Blue and Scarborough Fair have louder sound effects to distinguish the two. Bayonetta's taunts are sped up. The excess hair tendrils hanging from both her Bayonetta and Bayonetta 2 outfits now have individual physics. When the victory screen shows her name, Bayonetta's glasses glint at the edge. While this was present in her victory poses in Smash 4, it only showed for a brief moment. While veterans' facial expressions were typically upgraded, Bayonetta seems to lack expressions she possesed in the previous installment. Notably in her Screen KO, a wink in one of her victory animations, and during certain moves such as up tilt. Like all characters, Bayonetta's jumpsquat animation now takes 3 frames to complete (down from 4). Bayonetta's initial dash speed (1.6 → 1.936) and run speed (1.6 → 1.76) are much faster. Bayonetta walks slightly faster (0.9 → 0.945). Bayonetta's air speed is faster (0.97 → 1.019). Bayonetta is slightly lighter (84 → 81). This worsens her survivability, but also makes her harder to combo at higher percents. Bayonetta's traction is much higher (0.055 → 0.11). Forward roll has less ending lag (FAF 38 → 32). Bat Within also activates faster and has a longer duration (frames 3-5 → 2-5). Forward roll grants less intangibility (frames 6-19 → 6-15). Back roll has less ending lag (FAF 38 → 37). Bat Within also has a longer duration (frames 3-5 → 3-6). Back roll has more startup and grants less intangibility (frames 6-19 → 7-16). Spot dodge has less ending lag (FAF 30 → 26). Spot dodge has more startup and grants less intangibility (frames 5-19 → 6-17). Bat Within also activates slower (frame 1 → 2). Air dodge grants more intangibility (frames 5-27 → 5-31). Air dodge has more ending lag (FAF 37 → 46). With the reintroduction of directional air dodges, Bayonetta can take advantage of her special moves not causing helplessness by getting additional distance with a directional air dodge after using them. This slightly improves her recovery. However, Bayonetta's directional air dodge speed is lower relative to the cast, a trait she shares with Little Mac. This gives her more trouble in escaping combos and juggles. Bat Within cannot have it's direction altered, instead always going straight down. If Bayonetta is hit offstage and attempts to directional airdodge to recover, and Bat Within activates, this could cause her to SD. Much like other characters, Bayonetta's wall jump covers significantly less distance, making her more frail while offstage. Bullet Arts range has been significantly reduced on all of her moves. The maximum landing lag Bayonetta can receive increased (43 → 50). Witch Twist has less landing lag (19 → 18). Witch Twist to Afterburner Kick has less landing lag (26 → 25). Downwards Afterburner Kick has much more landing lag if it connects (20 → 30). Afterburner Kick to Downwards Afterburner kick, and DABK to DABK has much more landing lag (30 → 40). ABK to DABK still has 30 frames of landing lag. Whiffed Downwards Afterburner Kick can no longer autocancel, and it has 20 frames of landing lag. Bayonetta gains recovery frames for air dodging after witch twist (19 → 25), and combinations that would give her 32 frames of landing lag (32 → 42). Bayonetta's Down Air Recovery Frame cancel has been removed. Downwards Afterburner Kick's landing hitbox has 50 recovery frames after any combo minus Witch Twist to DABK and DABK alone. The first three hits have altered angles and knockback to keep opponents close to Bayonetta, akin to other neutral attacks. This allows them to connect better and jab lock, but removes their guaranteed jab cancel setups. The second and third hits have less startup (frame 9 → 7 (hit 2), 11 → 7 (hit 3)). The rapid jab deals less hitlag, making it harder to SDI out of. All hits deal less damage (1.5% → 1.4% (hits 1-2), 2.7% → 2.2% (hit 3), 0.3% → 0.2% (rapid jab), 1% → 0.5% (finisher, hit 1), 6% → 5% (finisher, hit 2)). The first three hits have more ending lag (FAF 26 → 32 (hit 1), 31 → 32 (hit 2), 34 → 40 (hit 3)). The first hit has slightly less range. It deals significantly less shield damage. The first three hits make opponents fall off edges, making it unable to combo into itself. The first and third hits deal less damage (3.5% → 3% (hit 1), 8.5% → 7% (hit 3)), though with the latter's knockback mostly compensated. The first hit's grounded hitbox launches opponents into the second hit rather than away from Bayonetta. Up tilt has more startup (frame 7 → 9). Up tilt has more ending lag (FAF 27 → 32), hindering its combo potential. The first hit deals less damage when clean (5% → 1.5%), being less than the late hit's damage. Down tilt has more ending lag (FAF 27 → 29), hindering its combo potential. It deals less damage (6%/7% → 5%/6%). While its knockback has not been fully compensated, its combo potential remains worse due to its increased ending lag. Dash attack has less ending lag (FAF 47 → 43). Bayonetta's smash attacks are no longer low priority. Bayonetta's smash attacks have a lower maximum damage multiplier (1.4× → 1.2×). Maximum damage multiplier is further reduced if she starts the move while an opponent is under the effects of Witch Time (1.4× → 1.1×). Bayonetta's smash attacks have additional ending lag if they hit a shield (FAF 0 → 8). Forward smash has less startup (frame 19 → 17). However, its total duration has not been fully compensated (FAF 68 → 67), giving it one frame more ending lag. It can now be angled. Forward, back and up aerial have less landing lag (14 frames → 12 (forward), 12 frames → 10 (back), 12 frames → 8 (up)). All aerials except down aerial have more landing lag if their Bullet Arts extensions are used (10 frames → 18 (neutral), 12 frames → 18 (forward), 12 → 16 (back, up)). This worsens Bayonetta's pressure ability with her neutral and up aerials. Neutral aerial deals drastically less knockback, no longer KOing under 300% from the center of most stages. While this allows it to combo for longer, it most significantly hinders Bayonetta's KO ability at high percents. The Bullet Arts extension deals less damage (4.5% → 3%). The Bullet Arts extension bullets deal less damage (0.5% → 0.4%). All hits deal more damage (3% → 4% (hit 1), 2.2% → 3.3% (hit 2), 6% → 7% (hit 3)), with knockback compensated on the third hit. All hits have more ending lag (FAF 27 → 38 (hit 1), 32 → 40 (hit 2), 40 → 47 (hit 3)). This prevents the first hit from comboing into After Burner Kick or Witch Twist, or being used repeatedly to drag opponents offstage, significantly weakening its utility. The first hit auto-cancels later (frame 28 → 30). Back aerial has more ending lag (FAF 30 → 35). Its hitboxes are smaller (6.2u/4.8u → 4.6u/4.2u). Up aerial deals less damage (9% → 7.5%) and its knockback scaling has been reduced (90 → 80). This significantly hinders its KO ability. It launches at a more horizontal angle (75° → 55°). While this allows it to combo into back aerial and After Burner Kick, it hinders its combo potential into most other moves at higher percents, and renders it vulnerable to LSI. Combined with the aforementioned nerfs, up aerial can no longer KO vertically from a ladder combo until much higher percents, unless it is initiated very close to the top blast line. The Bullet Arts extension deals less damage (4% → 3%). Down aerial deals set knockback to grounded opponents to always lead into the landing hit, allowing it to deal more damage and KO them more effectively. It deals less knockback to aerial opponents and with the landing hit, no longer being able to KO off a meteor smash at very low percents, and KOing later onstage. It has more ending lag (FAF 48 → 53), making it harder to use offstage without self-destructing. It has more landing lag (28 frames → 30). Dash and pivot grab have more startup (frame 9 → 10 (dash), 10 → 11 (pivot)). Bayonetta's hand grabs characters using a form of Umbran magic, as seen via a slightly updated animation where she swings her hand around, which is sparkling with a noticeable Umbran purple. Pummel deals more hitlag per hit (4 frames → 10), but has significantly less startup (frame 7, 14 → 1, 4) and ending lag (FAF 22 → 7), shortening its duration. It deals much less damage (1.6% (hits 1-2) → 0.6% (hit 1), 0.7% (hit 2); 3.2% → 1.3% total). Forward throw deals slightly more knockback, improving its KO potential. Bullet Climax's bullets have more range. It has more ending lag (FAF 71 → 76). It needs to be fully charged before it can be charge-canceled. It can only be held for up to one second upon reaching full charge. The second hit comes out faster (frame 54 → 51). It has less ending lag (FAF 78 → 73). All hits deal less damage (9%/8.5%/8% → 8%/7.5%/7% (hit 1, clean/mid/late), 6% → 5% (hit 2)). The second hit cannot be performed if the first hit is shielded. Combined with attacks no longer being able to cross-up shields in Ultimate, this makes the move much easier to punish. It goes on a more horizontal angle and gains less vertical height, worsening her recovery. It bounces farther away when hitting a wall, sometimes not snapping the ledge afterwards requiring the use of directional airdodge to grab the ledge. Upon hitting an opponent with After Burner Kick, the second one can only be used within a one-second window afterwards, hindering its mixup potential. Additionally, it cannot be used altogether if the first one is shielded. Downwards After Burner Kick launches grounded opponents at a higher angle, much like in Smash 4 before update 1.1.6, allowing it to be a reliable combo starter once again. Downwards After Burner Kick can no longer be autocanceled. Witch Twist's looping hits deal less hitlag, making them harder to SDI out of. It has increased startup (frame 4 → 6) and ending lag (FAF 29 → 32), weakening it as an out of shield option and followup. It gains less vertical height making it even harder to drag opponents at higher blast zones as well as worsening her recovery. It takes much longer to sweetspot edges from the front (frame 11 → 27), and can no longer sweetspot them from behind. It has a smaller hitbox that is not as low, meaning it cannot hit some crouching or shorter opponents such as Pichu. Witch Time's slowdown hitbox is twice as large (30u → 60u), allowing it to affect opponents from much farther distances. Witch Time has increased startup with a shorter counter window (frames 5-21 → 8-21), and grants less intangibility (frames 5-16 → 8-17). It is now the counter with the shortest counter window. It has significantly more ending lag (FAF 50 → 67), making it easier to punish if missed. It also takes longer for Bayonetta to act out of the move after its activation (frame 15 → 20). Its base duration has been significantly lowered (180 frames → 90), no longer being effective at any percent range, even against uncharged smash attacks. However, its duration scaling is higher (10 → 30), meaning its duration increases by 30 frames for every 100% the opponent takes, rather than by 10 frames. This mostly compensates for the move's lower base duration at higher percents, and allows it to reach its maximum duration faster. It has less penalty frames per use (75 → 60). Its regeneration per frame is slower (0.06 → 0.03). Witch Time's slowdown potency has been reduced making her unable to connect multiple moves in a row before the opponent is too far away. Slowdown potency is further reduced if Witch Time is activated on its last active frames where it overlaps with Bat Within, making it unable to punish most multihit moves. Witch Time scales with the power of the move it is used on, so using Witch Time on a weaker move such as a jab will result in the effect lasting for a much shorter time, and a stronger move such as a smash attack will result in a longer effect. The screen turns dark whenever someone is affected by Witch Time. When Witch Time is activated, opponents move a little faster. This makes it easier to dodge her attacks but effectively reduces intangibility for every consecutive dodges during the final smash. Infernal Climax deals less damage before releasing opponents (30% → 28% (Gomorrah), 15% → 13% (full Climax Gauge)). When the Final Smash ends, opponents take an additional 10% damage. Infinite Witch Time glitch created. Infinite Witch Time glitch fixed. Bayonetta can grab ledges faster after using neutral aerial (59 frames → 57). Bullet Climax deals less shield damage. Bayonetta can wall jump and wall cling. 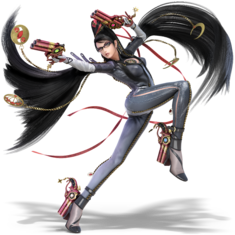 1.4% Bayonetta performs 3 pistol whips (a lunge with her left gun, a back-handed strike with her right, and an uppercut with the left), then performs a barrage of pistol whips, concluded by a thrusting pistol whip. Bayonetta will only enter the rapid strike if the button is mashed. The Bullet Arts version of all hits of the combo has her shoot her guns forward, with the exception of the third hit, which shoots forward and upward in a diagonal direction behind herself. Based on Bayonetta's Punch + Punch + Punch • Punch (PPP • P) combo from Bayonetta 2. Consecutive Kicks 3% (hits 1 and 2), 7% (hit 3) Bayonetta performs 3 consecutive kicks (a front kick, a spin kick, and an upward roundhouse kick), the last hit knocking the opponent diagonally upward. Functions like a neutral attack, requiring further inputs to continue the combo. The Bullet Arts version of each strike has her fire her guns at different angles: the first is straight forward, the second is slightly upward, and the third is diagonally upward. Based on Bayonetta's Kick + Kick + Kick combo while wielding Love is Blue. 1.5% (hit 1, clean), 2% (hit 1, late), 6% (hit 2) An upwards pistol whip. Hits twice. At low percents, can combo into up air. The first hit has a hitbox slightly above and in front Bayonetta's head that does slightly more damage than on the ground, but it can only hit midair opponents. The Bullet Arts version of this move fires her gun above her. It is based on the delayed punch launcher. Kick Attack 6% (foot), 5% (leg) A sweep kick. The Bullet Arts version of this move fires two guns in front of herself and one behind herself. Based on the final hit of Bayonetta's PPK combo while wielding Love is Blue. Stiletto 10% (early), 8% (late) The Stiletto: a forward rushing pistol whip. It has noticeable start-up. The Bullet Arts version of this move fires her gun in front of herself. 14% (wrist), 16% (fist) Uses Wicked Weaves to summon Madama Butterfly's arm, which is used to throw a punch. It has great horizontal range and Madama Butterfly's hitbox cannot be reversed. However, it has high ending lag and low priority, making it fairly easy to cancel out. It can be angled slightly upward and downward. The Bullet Arts version of this move fires her gun depending on how the smash was angled: forward if unangled, slightly upward if angled up, and slightly downward if angled down. Based on the final hit of Bayonetta's PPP • P combo in Bayonetta 2. 17% (clean), 16% (mid), 15% (late) Uses Wicked Weaves to summon Madama Butterfly's arm, which is used to throw an uppercut. It hits directly in front of Bayonetta, and thus leaves her vulnerable from behind and directly above. It has rather noticeable start-up, high ending lag and low priority, but it is her strongest attack when clean, as it is capable of KOing middleweights around 100%. Madama Buterfly's hitbox cannot be reversed. The Bullet Arts version of this move fires one gun forward and one upward. It is based on the delayed punch Wicked Weave launcher. Heel Stomp 5% (Bayonetta), 16% (Madama Butterfly, clean), 15% (Madama Butterfly, late) The Heel Stomp; Bayonetta stamps her foot on the ground while simultaneously using Wicked Weaves to summon Madama Butterfly's foot, which stomps shortly after her. There is a hitbox on Bayonetta's leg that leads into the main hitbox. It can meteor smash opponents that are either on the edge or in midair, making it a potent edge-guarding option. Like up smash, it only hits in front of her, has high ending lag and low priority, but has considerable vertical range. Madama Butterfly's hitbox cannot be reversed. Oddly, the Bullet Arts version of this move fires the guns on her feet downward into the ground, making it useless except for opponents directly touching her front or back. 8% (clean), 6% (late), 3% (Bullet Arts extension) A spinning roundhouse kick. It hits around Bayonetta and continuing the input for the Bullet Arts version has her continue to spin for a few seconds. It has very good coverage, as it can hit opponents adjacent and/or below her. The Bullet Arts version of this move fires her guns to her sides both horizontally and diagonally below her. It is based on the aerial Bullet Climax in Bayonetta. 4% (hit 1), 3.3% (hit 2), 7% (hit 3) Bayonetta performs 2 pistol whips (a straight with her left, and a backhanded strike with her right), and a downward-arc spin kick. Functions like a neutral attack, requiring further inputs to continue the combo. The Bullet Arts version of this move fires in front of her for the first two hits, while the third hit fires three guns downward (two of them being slightly diagonal) and one upward. Based on Bayonetta's aerial PPK combo while wielding Love is Blue. 10% (leg), 13% (foot) A high-angle back kick. The Bullet Arts version of this move fires one gun behind her at an upward angle. Based on the second hit of Bayonetta's aerial PK combo while wielding Love is Blue. 7.5% (kick), 3% (Bullet Arts extension) A bicycle kick. Very fast. Can combo from Witch Twist at low percents. The Bullet Arts version of this move has her fire her guns, whilst she performs a modified version of the aú aberto, one of many cartwheeling kicks in capoeira. While this version deals less damage, it provides excellent coverage that covers wide areas around her, making it useful for edge-guarding and dealing additional damage. It is based on the kick launcher in Bayonetta. 7% (body), 8% (leg), 9% (heel), 5% (landing) A split-legged axe kick. A stall-then-fall with low duration and ending lag, which allows her to safely recover afterward if used off-stage. It is a meteor smash when hitting with her heel, while its landing hit has extremely high knockback, both of which make it a viable, but punishable KOing option overall. Can be used after her special move combos to catch opponents who attempt to punish her increased landing lag. The Bullet Arts version fires one gun from her heel forward, but only upon landing. It is based on Bayonetta's standard aerial kick in Bayonetta. — Reaches out, with her hand emanating purple Umbran Magic. Slap Punish Attack 0.6% (hit 1), 0.7% (hit 2) The Slap Punish Attack. It has average speed, but is unique in that it consists of two hits per input. As a result, it is possible for the opponent to break free in the middle of the pummel, and thus miss the second hit entirely. Tetsuzanko 7% (hit), 3% (throw) The Tetsuzanko, a technique based on the tie shan kao used in Bajiquan. It is her strongest throw. She occasionally says "十年早いんだよ! (Ten years too early! )", even in the English version of the game. The quote is a reference to Akira Yuki's famous quote in the Virtua Fighter series, and is said occasionally by Bayonetta herself in Bayonetta. 3% (kick), 6% (throw) A jumping roundhouse kick. Possibly based on the final hit of her PPPK combo while wielding Love is Blue. 3% (kick), 4.5% (throw) An outside crescent kick. A good combo starter that can lead into Witch Twist or up aerial until medium to high percents. The pose Bayonetta assumes afterward is based on the final hit of her PPK combo while wielding Scarborough Fair. 3% (stomp), 5% (throw) Stomps the opponent into the ground. Based on the final hit of Bayonetta's PPPKKK combo while wielding Love is Blue. 7% A low-angle kick performed from a windmill, an acrobatic technique used in breakdancing. 7% A low-angle kick performed from a windmill. 5% A low-angle kick performed from a windmill. 9% Performs a hook kick while climbing up. Bullet Climax 1.35% (uncharged), 2.7% (charged) Fires bullets at a slight angle. When held, Bayonetta instead fires Charge Bullets, which are stronger but only active during the first four shots. The move can be cancelled by shielding or rolling, but only when fully charged. Due to its angle, it is useful for edge-guarding and hindering aerial approaches. Bayonetta alternates between two animations while charging and firing for each time she uses Bullet Climax: either she stands in a semi-crouching position and fires the guns in her hands, or she does a handstand and fires the guns on her feet. Both function identically, although Kirby's Copy Ability fires from noticeably different heights. This move takes inspiration from the Bullet Climax and Charge Bullet techniques from Bayonetta and Bayonetta 2, respectively. Heel Slide/After Burner Kick 8% (Heel Slide, hit 1, clean), 7.5% (Heel Slide, hit 1, mid), 7% (Heel Slide, hit 1, late), 5% (Heel Slide, hit 2), 6% (After Burner Kick, standard, early/late), 7% (After Burner Kick, standard, clean), 6.5% (After Burner Kick, downward, kick), 5% (After Burner Kick, downward, landing) A kick that functions differently when used on the ground or in midair. Heel Slide: On the ground, she performs the Heel Slide. If the button is held, Bayonetta will then follow it up with an aú aberto. She will also fire the guns on her feet as she slides. It is her primary combo starter, due to the follow-up kick launching the opponent upward. If the first hit is shielded, however, she will not transition to the aú aberto. She will also be under considerable endlag, leaving her open to punishing. After Burner Kick: In the air, she alternately performs the After Burner Kick, which can be performed twice in a row as long as the first kick connects. If shielded, it can't transition into another After Burner Kick. It can be angled downward by two different methods: holding the control stick down before inputting the move (moving the stick in a quarter-circle), or by flicking the control stick down as soon as the move is inputted but before the move comes out. The second method takes strict timing: if not correctly, she will end up doing the standard After Burner Kick. If the button is held for the standard version, Bayonetta will fire the guns on her feet (one slightly upward, and one slightly downward). Both versions of After Burner Kick are her primary aerial follow-ups. All based on the individual techniques from the Bayonetta games, with minor differences. Witch Twist 3% (ground, hits 1 and 7), 0.2% (hits 2 - 5), 2% (air, hit 1) An ascending, corkscrew pistol-whip. It hits multiple times but covers minimal vertical distance and extremely minimal horizontal distance, similarly to Rising Uppercut. Despite this, Witch Twist is still a very useful recovery option, as using it after a jump allows Bayonetta to use her double jump, and then use another Witch Twist. Holding the button has Bayonetta fire her guns from her hands and feet; hitting anyone directly above or below, to her sides, and slightly diagonally under her. Based on the technique of the same name from Bayonetta, as well as a variation from Bayonetta 2 known as Witch Strike; the ability to hold guns is taken from the former, but lacks the dodging spinning kick at the start. Otherwise performs identically to the latter, including the ability to use a second one after a double jump. With precise timing (a 3 frame window to be exact), a Double Jump can be cancelled into Witch Twist, thereby saving her jump in a similar way to Smash 4. This drastically improves her combo game and enables some particularly powerful ladder combos, as well as some much needed recovery mix-ups. This can be executed with both the first and second Witch Twists (as long as the double jump is unused) only to use the double jump right after, essentially giving her a maximum of three midair jumps, though only one would reach the top of its arch. Witch Time — Uses her magic to slow down time around an opponent who attacks her. Its duration is dependent on several factors: the opponent's damage (more damage = longer duration), Bayonetta's damage (more damage = shorter duration), frequency (using Witch Time too often will decrease the duration), and the strength of the attack that initiates Witch Time (the stronger the attack is, the longer the opponent is slowed down). However, if Witch Time is activated too late, then Bat Within is activated instead. Bat Within teleports Bayonetta in any direction, but unlike in the Bayonetta series, it halves the damage received, rather than negating it. Based on the same ability from the Bayonetta games, albeit only slowing down the attacking opponent as opposed to all opponents. Infernal Climax 28% (Gomorrah), 13% (bonus spell), 10% (end) Activates Witch Time to affect the whole stage. While this effect is active, Bayonetta has a limited time to deal damage to her opponents in order to fill up the Climax Gauge. The Climax Gauge will also fill itself up slowly. Once it is filled, she has to deal knockback to any opponent before a cutscene occurs. The cutscene consists of her using her hair as a conduit to summon Gomorrah, who then damages any opponents suffering hitstun from Bayonetta's attacks by chomping them four times before they are launched with set knockback. The attack button can be mashed during the attack to fill a second Climax Gauge that deals an additional 15% after the cutscene. Once the cutscene ends, anyone with 100% or more will be instantly KO'd. Anyone below 100% will take an additional 10% as the Final Smash ends. After using Witch Twist, Afterburner Kick, or Downwards Afterburner Kick, upon landing Bayonetta will be unable to move for a set amount of frames depending on the combination of moves used. Recovery Frames are in tiers, with each tier having more recovery frames than the previous. The tiers are: 19 frames, 20 frames, 25 frames, 30 frames, 32 frames, 40 frames, 42 frames, and 50 frames. In addition, air dodges and aerial end lag may add to her recovery frames. Emerges from her Bat Within form while surrounded by the Umbra Witches' symbol, then proceeds to wield her guns. Up taunt: Twirls around, moves both arms around her in a graceful manner, then strikes a pose with both arms over her head, saying, "If you need to learn how to talk to a lady, ask your mum." (レディの扱い方、ママに教えて貰いなさい, If you can't handle a lady, ask your mum.) This taunt has been significantly shortened from the last game, although it can still be cancelled. It is based on her long taunt from Bayonetta 2. Side taunt: Gracefully spins around, then points both guns directly in front of herself, saying, "New 'do, dead you." (動くと死ぬわよ, You move, you die.) The quote comes from her short taunt while wielding Salamandra in Bayonetta 2. Down taunt: Strikes a pose while flourishing her guns before looking away and then looking forward, while her glasses briefly emit a light purple glint upon concluding. Significantly shortened from the last game, although it can still be cancelled. Based on the dances she performs prior to fighting the first Joy she encounters in Bayonetta. Waves one of her guns in an inviting motion, while resting the other on her hip. Holds her left gun in front of herself, and her right gun upward beside her head. This idle pose only occurs once she ends any ground attack, and reverts to her standard idle animation after a few seconds. All of Bayonetta's victory quotes are based on taunts from Bayonetta 2 while wielding various weapons; the associated weapon for each is listed in parentheses. Dances and says "Miss me, baby?" (Chernobog; 私はここよ, I'm right here.). The dance is similar to her down taunt, with a slightly different ending pose. In the Japanese version, Bayonetta does not turn her head. Performs the Break Dance move then strikes a pose, saying "Dreadful." (gun-type weapons or Rodin; 退屈だわ, Boring.) or "Don't make me beg." (Takemikazuchi; 遠慮しないで, Don't be shy.). The pose is similar to her crouch. Bayonetta steps back and sticks up her guns, pirouettes like a ballerina, then aims her guns to the right with a pose, saying "That all you got?" (Alruna; 全力を見せてよ, Show me your full power.) or "You're making it easy." (Rakshasa; 楽勝ね, Too easy.). CaptainZack - Uses Bayonetta as a secondary main to Peach and Daisy and placed 9th at GENESIS 6. Geist - Debuted as one of the best Bayonetta players from Midwest in the United States and placed 33rd at Frostbite 2019.
tamim - Placed 5th at Glitch 6, 7th at LAN ETS 2019 and 17th at Let's Make Moves. Lima - Debuted as one of the best Bayonetta players in the world from 4 and placed 33rd GENESIS 6. All of Bayonetta's opponents have wings, in reference to her battles against angels, with the exception of Giant Palutena, who is a reference to the final boss battle of Bayonetta against Jubileus, the Creator. 4 Giant Charizard Skyloft Time For The Climax! 6 Pit (x6) Skyworld Let's Hit The Climax! Note: When fighting Charizard, its Pokémon Trainer is absent. Additionally, every stage plays a track from the Bayonetta universe, no matter what universe the stage originates from. Bayonetta was among the fighters summoned to the cliffside to fight against the army of Master Hands. During the opening cutscene, Bayonetta was present when Galeem unleashed his beams of light. Bayonetta dodged a beam of light, activating her Bat Within, but she was then vaporized immediately after she reformed her body, and later placed under Galeem's imprisonment alongside the rest of the fighters, excluding Kirby. Bayonetta was one of the many fighters that fell under Dharkon's control upon Galeem's first defeat, and the last fighter to be found to be imprisoned by him. In The Final Battle, she is called by Dharkon as part of his reinforcements after Roy is awakened and Master Hand is beaten. She is a necessary unlock to achieve the true ending, as awakening her leads to a battle with Crazy Hand that frees him from Dharkon's control (both of whom's defeats greatly shifts the balance of power in Galeem's favor). Bayonetta's Fighter Spirits can be obtained by completing Classic Mode. They are also available periodically for purchase in the shop for 500 coins. Unlocking Bayonetta in World of Light allows the player to preview the first spirit below in the Spirit List under the name "???". As Fighter Spirits, they cannot be used in Spirit Battles and are purely aesthetic. Each Fighter Spirit has an alternate version that replaces them with their artwork in Ultimate. Additionally, her younger form, Cereza, appears as a Support Spirit. •The enemy will suddenly have a Final Smash after a little while Let's Hit The Climax! •The enemy favors smash attacks Let's Hit The Climax! Taunting on Umbra Clock Tower. Performing Bullet Climax on Skyworld. Attacking Ganondorf on Mario Galaxy. Jumping next to Villager on Tortimer Island. Attacking Samus with her forward smash on Spirit Train. Crouching near Mr. Saturn on Yoshi's Story. Performing After-Burner Kick on Castle Siege. Taunting near Dark Pit on Great Plateau Tower. Wall clinging with Diddy Kong on Alolan Exeggutor. Bayonetta using a Wicked Weave against Isaac's Pound Psynergy on Kalos Pokémon League. Bayonetta's official artwork strongly resembles her official artwork for Bayonetta 2, albeit with her arms pointed outwards rather than inwards. Likewise, Bayonetta's official artwork based on the first game resembles her official artwork for Bayonetta, only mirrored. Bayonetta can be unlocked by clearing Classic Mode as either Sonic or Mario. This could be a reference to Sega publishing the first Bayonetta game and Nintendo publishing the sequels. The Umbra Clock Tower being the stage in the first round of Bayonetta's classic mode may be a reference to it being the setting of "The Witch Hunts", the opening scene of the first Bayonetta game. Similarly, the fight with Mecha Ridley in the Reset Bomb Forest may be a reference to the fight against Fortitudo in the Colisseum Ruins. An interview with Masahiro Sakurai revealed that Bayonetta and Palutena were under consideration to survive Galeem's attack in the World of Light opening. They were turned down in favor of Kirby, due to both women being very complex characters to use for beginners and that other characters of their series were also turned into spirits, stating that Bayonetta couldn't escape to Purgatorio as Galeem's attack reached there and her enemies were turned into spirits. While Palutena is designed to always be one of the final characters unlocked, outside of World of Light, Bayonetta can be unlocked very early, potentially as the second character to be unlocked (by clearing Classic Mode with Mario and/or Sonic twice). Bayonetta is the only third-party character and the only sole franchise representative unlocked in the Final Battle realm in World of Light. In all versions of the game, Bayonetta has two separate menus for her Sound Test voice clips, one for her Bayonetta 2 design and one for her Bayonetta design, despite both versions of Bayonetta using the same voice clips in western versions. This is because the Japanese version has separate voice clips for her in Japanese and English. The Cereza spirit battle is a direct reference to Chapter VI in Bayonetta, in which Bayonetta has to protect Cereza and loses if she dies. Bayonetta's Classic Mode is one of the few whose boss round does not feature a designated boss, instead fighting characters who are otherwise playable (in this case, Palutena). 1. ^ translates to "Open Cartwheel"
2. ^ translates to "Iron Mountain Lean"
3. ^ translates to "By Iron Mountain"